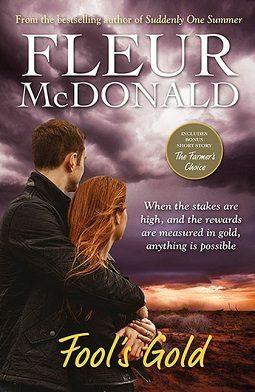 We take a step back in time – well a couple – in this latest novel by Australian author Fleur McDonald. We’ve met Detective Dave Burrows in her rural romantic suspense series (see my reviews of Suddenly One Summer and Sapphire Falls) and here we’re taken back to where it all began and he’s a newly appointed Detective and has moved with new wife, Melinda to rural WA, resplendent with dry heat, flies galore and brilliantly red soil. The book also opens with a snippet from 1945 and a suicide that sets off a series of events for decades to come. Detective Dave Burrows' first posting to the far West goldfields town of Barrabine holds everything he's looking for but Melinda, his wife of two weeks, is devastated at leaving behind her family, friends and career. More comfortable in heels than RM Williams, Melinda walked away from her much-loved job in the city as a paediatric nurse to follow Dave into the bush. Dave settles in easily to the plain-speaking toughness of his new town, determined to do well, knowing that Barrabine could be his stepping stone into the elite Stock Squad. But will his marriage last the distance? We’ve met Dave in McDonald’s previous books but as I’d not read all of them I assumed we’d learned more about him there. He’s been pivotal to the cases in those books but not necessarily the central character. Here, however…. it’s all about Dave and a case that kicks off his career as a detective. Heading to the bush is – what Dave hopes is – his first step towards a career in the police Stock Squad. And there’s a snippet suggesting that his father expectedly ousted him from the family farm in favour of his brothers years before. And in my version of the book, there’s a short story at the end centred around his departure from the family farm seven years before the events of this novel takes place. McDonald includes a lot of background information here about mines and gold mining – from the large developers buying up small claims, to the small prospectors… keeping quiet about any luck they have. I found the balance between camaraderie and competitiveness interesting. McDonald does a good job of giving us insight into the addictive effect of the rather metaphorical ‘gold rush’, particularly through the old timers we meet who happily live simplistically in isolation and can’t be tempted away. I very much enjoyed the character arc Dave’s wife Melinda is taken on in this book. She’s supportive of Dave but far from happy about this move – slightly resentful at having to put her career on hold and move away from her family. Interestingly I also appreciated the fact that Dave was happily accepted into his new post without the oft-included local politics, rivalry or suspicion when a newbie arrives. His boss and colleagues are supportive and welcoming and I was personally happy that the ‘hated newcomer’ cliche was avoided. If I was sticking to the Aussie colloquialisms I’d say McDonald certainly knows how to spin a yarn. This was strangely comforting – an excellent and easy read and the sort of book I didn’t want to end. Fool’s Gold by Fleur McDonald will be published in Australia by Allen & Unwin on 21 March 2018.